Earlier this year, a prominent friend of mine was tasked with coming up with a list of behavioral economics book recommendations for the military leaders of a G7 country and I was on the limited email list asking for input. While I read a lot and I’ve offered up books to sports teams and fortune 100 management teams, I’ve never contributed to something as broad as educating a nation’s military leaders. While I have a huge behavorial economics reading list, this wasn’t where I started. Not only did I want to contribute, but I wanted to choose books that these military leaders wouldn’t normally have come across in everyday life. Books they were unlikely to have read. Books that offered perspective. Given that I couldn’t talk to them outright, I was really trying to answer the question ‘what would I like to communicate to military leaders through non-fiction books?’ There were no easy answers. I needed to offer something timeless. Not so outside the box that they wouldn’t approach it, and not so hard to find that those purchasing the books would give up and move on to the next one on the list. And it can’t be so big they get intimidated by the commitment to read. On top of that, you need a book that starts strong because, in my experience of dealing with C-level executives, they stop paying attention after about 20 pages if it’s not relevant or challenging them in the right way. In short there is no one-size-fits-all but to make the biggest impact you have to consider all of these factors. While the justifications for why people chose the books below are confidential, I can tell you what books were on the final email that I saw. I left one book off the list, which I thought was a little too controversial to post. These books have nothing to do with military per se, rather they deal with enduring concepts like ecology, intuition, game theory, strategy, biology, second order thinking, and behavioral psychology. In short these books would benefit most people who want to improve their ability to think, which is why I’m sharing them with you. If you’re so inclined you can try to guess which ones I recommended in the comments. Read wisely. 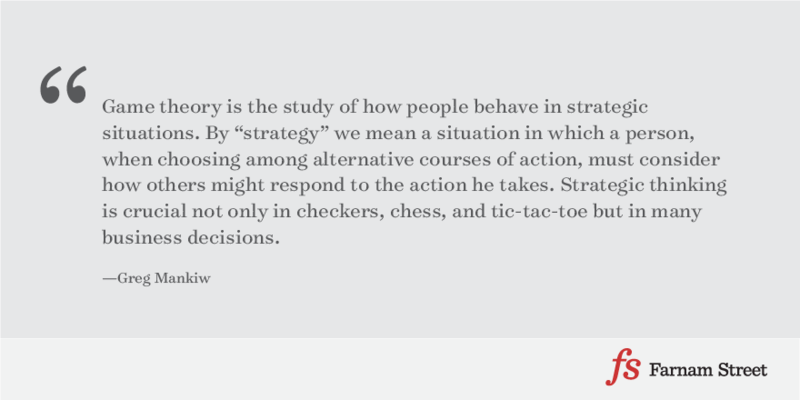 Games of Strategy (Fourth Edition) by Avinash Dixit, Susan Skeath & David H. Reiley, Jr. The Evolution of War and its Cognitive Foundations (PDF) by John Tooby & Leda Cosmides. Fight the Power: Lanchester’s Laws of Combat in Human Evolution by Dominic D.P. Johnson & Niall J. MacKay. Good opinions are a lot of work. When I think about the world in which we live and the organizations in which we work, I can’t help but think that few people have the intellectual honesty, time, and discipline required to hold a view. 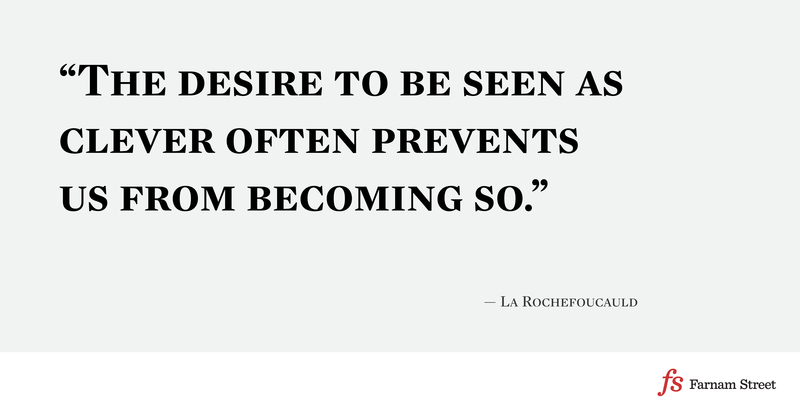 We have a bias for action and, equally important, a bias for the appearance of knowledge. 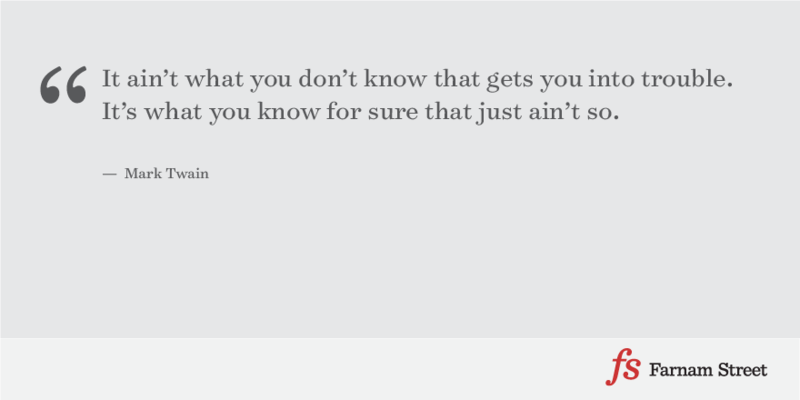 When’s the last time you heard someone say I don’t know? It seems the higher up the corporate ladder you go, the more unlikely you are to say or hear those three words. No one wants to tell the boss they don’t know and the boss certainly doesn’t want to let on that they don’t know either. We have too much of our self-worth wrapped up in our profession. If you’re a knowledge worker and you walk around saying “I don’t know” people are going to start to think you’re pretty stupid. So we talk in abstractions and fog and create the appearance of knowledge. Who has time to do the work required to hold an opinion? There is always an email to respond to, an urgent request from your boss, paper to move from one side of your desk to the other, etc. So we don’t do the work. But so few others do the work either. At 4:45 pm you receive a 4 page proposal in your inbox. The proposal is to be decided on the next day at a meeting with 12 people. If we really wanted to do the work necessary to hold an opinion we’d have to: read the document from start to finish; talk to anyone you can find about the proposal; listen to arguments from others for and against it; verify the facts; consider our assumptions; talk to someone who has been through something similar before; verify the framing of the problem is not too narrow or wide; make sure the solution solves the problem; etc. So we don’t do the work. Yet we need an opinion for the meeting, or, perhaps more accurately, a sound-byte. So we skim the document again looking for something we can support; something that shows we’ve thought about it, despite the fact we haven’t. We spend the time we should be learning and understanding something running around trying to make it look like we know everything. We’re doing work alright: busywork. We do what’s easy. We turn up at the meeting the next day to discuss the proposal but our only real goal is to find a brief pause in the conversation so we can insert our pre-scripted, fact-deficient, obfuscating generality into the conversation. We do, after-all, have to maintain appearances. The proposal ultimately reaches consensus, but this was never really in doubt. If you flip this around for a second, it must be the easiest decision in the world. Think about it, here you have a room full of smart people all in agreement on the best way to proceed. How often does that happen? A no-brainer like that is hardly worth a memo or even a meeting. And organizational incentives encourage this behavior. If the group makes the right decision you can take take credit. And, if by chance things go wrong, you don’t get the blame. Group decisions, especially ones with consensus, allow for all of the participants to have the upside and few if any to have the downside. When you’re talking to someone unfamiliar with the situation you’d offer something more clever like ‘I thought that decision was wrong but no one would listen to me,’ knowing full well they can’t prove you wrong. And just like that, one-by-one, everyone in attendance at the meeting is absolved. Say, rather than jetting off to pick up the kids at 5 you stay and do the work required to have an opinion. While you get home around 11, exhausted, you are now comfortable with a well thought out opinion on the proposal. Maybe two things happen at this point. If you’ve done the work and you reached the same conclusion at the proposal, you feel like you just wasted 6 hours. If, however, you do the work and you reach a different conclusion, things get more interesting. You show up at the meeting and mention that you thought about this and reached a different conclusion — In fact, you determine this proposal doesn’t solve the problem. It’s nothing more than lipstick. So you speak up. And in the process, you risk being labelled as a dissenting troublemaker. Why, because no one else has done the work. In short you’d expose your thinking and open yourself up. You’d be vulnerable to people who haven’t really done the work. If you expect them to say OK, that sounds good, you’d be wrong. After all, if they’re so easy swayed by your rational thinking, it looks like they haven’t done the work. Instead, they need to show they’ve already thought about your reasoning and arguments and formed a different opinion. Rather than stick to facts, they might respond with hard to pin down jargon or corporate speak — facts will rarely surface in a rebuttal. The only way to argue that, and actually have a conversation, is to ask what the anticipated synergies are or to talk about the plan in detail, or bring Doug into the room. But that’s a dangerous game akin to telling the emperor he has no clothes. If you push too far you won’t be at the next meeting because everyone knows you’ll do the work and that means they know that by inviting you they’ll be forced to think about things a little more, to anticipate arguments, etc. In short, inviting you means more work for them. It’s nothing personal. Some college students used game theory to get an A by exploiting a loophole in the grading curve. Andrew Kelly, a student in Fröhlich’s Introduction to Programming class who was one of the boycott’s key organizers, explained the logic of the students’ decision via e-mail: “Handing out 0’s to your classmates will not improve your performance in this course,” Kelly said. In this one-off final exam, there are at least two Bayesian Nash equilibria (a stable outcome, where no student has an incentive to change his strategy after considering the other students’ strategies). Equilibrium #1 is that no one takes the test, and equilibrium #2 is that everyone takes the test. Both equilibria depend on what all the students believe their peers will do. If all students believe that everyone will boycott with 100 percent certainty, then everyone should boycott (#1). But if anyone suspects that even one person will break the boycott, then at least someone will break the boycott, and everyone else will update their choices and decide to take the exam (#2). Update (via metafilter): In 2009, Peter Fröhlich, the instructor mentioned above, published Game Design: Tricking Students into Learning More. Still curious? Learn more about game theory with the Prisoners’ Dilemma. What are the most important ideas ever put forward in social science? I’m not asking what are the best ideas, so the truth of them is only obliquely relevant: a very important idea may be largely false. (I think it still must contain some germ of truth, or it would have no plausibility.) Think of it this way: if you were teaching a course called “The Great Ideas of the Social Sciences,” what would you want to make sure you included?